Timothy Hay | Anderson Hay & Grain Co., Inc.
Timothy Hay is an exceptional roughage and fiber source. 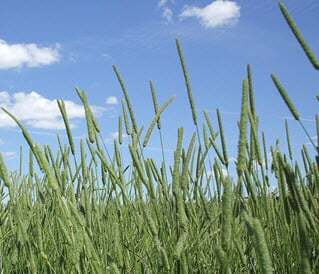 It is a late-maturing bunchgrass with a relatively low protein and high fiber content. The long stem and consistent quality allows good consumption and provides good conditioning for livestock. Timothy hay forms a long bulb as it grows which stores carbohydrates. The leaves are smooth and hairless, and seeds are very small and can number up to three million seeds per kilogram. Timothy hay is a cool-season grass with specific climate requirements due to its shallow root system. It grows best in areas with cool springs and dry, warm summers. Washington State is known world-wide for its Timothy hay quality and has perfectly suited growing and harvesting conditions. 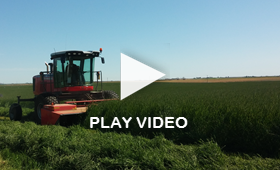 Once the grass hay is cut, it is sun-cured in windrows where the warm winds dry the hay to a moisture level that allows for compressed baling and storage without moisture and mold issues. The low precipitation levels in this region allow for perfectly sun-cured hay with low risk of rain washing out any color or nutrients while in the windrows. For many years, Timothy hay has been well known and widely used in the race horse industry. The product was discovered by race horse owners as their premium feed for award-winning Kentucky Derby horses.